Does Rebounding Really Work For Weight Loss? Why Are Rebounders So Expensive? How Much Do They Cost? When we picture a typical summer afternoon, we usually hear the loud, excited squeals of our kids as they jump on the trampoline. Clearly, that is something they enjoy doing. But what if we told you that the trampoline isn’t just fun and games? This is true, and soon you’ll find out why. We will walk you through the different stages of child development. As we do so, we will look at the various psychological and health benefits of trampolining for kids. The science might bore you a bit, but we are certain you won’t look at a trampoline the same way again. At this stage, children require very keen attention. They learn to accept themselves as an independent identity, which is why a toddler’s favorite word is “No!”. They seek emotional support and guidance. They also need careful training and support in strengthening their muscles. Now that they know how to walk, their muscles are growing and need to be exercised the right way. The best way to protect the heart from causing trouble in the future is to take care of it from the very beginning. What could be a better time to start than as a toddler? The trampoline provides a great exercise for the heart. The muscles relax and contract with every bounce, making the heart stronger and its muscles more toned. Jumping on the trampoline can also open up new vessels in a toddler’s cardiovascular system. In the long run, these vessels can protect your child from any kind of heart disease. No doubt, it’s best to start exercising the heart from a very young age. However, even if you’re a parent or a grandparent, it’s never too late. Buy a trampoline and start your rebounding routine immediately. Just don’t forget to consult your doctor first! Flexibility is important for people of all age groups. Being flexible allows you to perform a range of movements without experiencing sore muscles afterward. If your body is flexible, you’ll be able to walk, run or climb the stairs without the usual heavy breathing that follows. Toddlers are just beginning to realize all the different movements they can make using their limbs. So it is crucial that their flexibility is improved in the process. Fortunately, the trampoline is a great way to do this. As the toddler jumps up and down on the trampoline, their muscles will contract and relax several times. Furthermore, bouncing on the trampoline means you fall on the mat in different positions. Even when you bounce on it, the legs and hands are stretched in different ways. All of this contributes to improving a toddler’s flexibility. As a result, when they are teenagers, they will find it very easy to run or walk. This could provide an added benefit in their athletic career, for example. ‘Motor skills’ refers to all the precise movements that we learn to master. Basically, the ability to perform acts such as dancing, playing a sport or even running a marathon. Although some parents deem these acts unnecessary (no offense intended), they are imperative for the long-term success of children. We know that everyone isn’t made to be an Einstein. Some people grow up to become a Michelangelo or a Michael Jordan. What we are getting at is that motor skills can make or break a child’s future. One of the trampoline benefits for kids is that it’s a great way to develop motor skills. When a toddler is jumping up and down on a trampoline, they’re making use of both the left and the right sides of the body. This, in turn, activates both the left and the right hemisphere of the brain. We won’t delve too much into the details of it. But when both hemispheres are strongly active, the child will grow to be artistic and with a high IQ. When it comes to toddlers, too many people focus only on their IQ. We have plenty of puzzles and toys that will teach them numbers and the alphabet. But only a very few means exist to boost their physical performance. 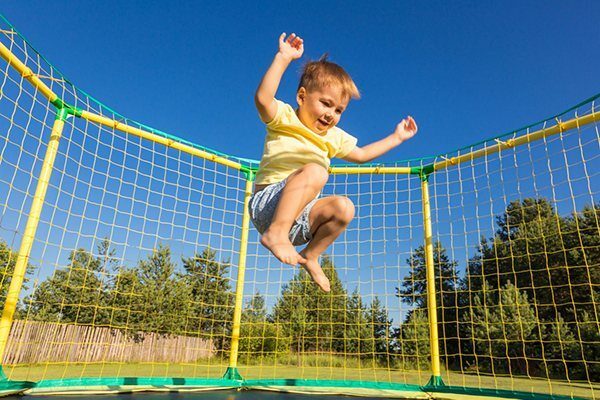 Luckily, there are several health benefits of trampolining for kids. 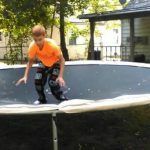 Unlike other exercises that are impossible for someone who is just learning to walk, the trampoline is easy and convenient. It’s also lots of fun, so your toddler can benefit from it and enjoy the time spent on it. As their parent, you too can jump right in because it immensely benefits adults as well. Preschoolers are often bubbling with curiosity — a trait not every adult has the patience to tolerate. Nonetheless, they want to build, discover, find out and learn all there is to know about everything they see. 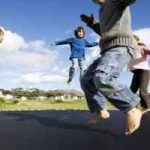 So what are the trampoline benefits for kids of this age? You might be wondering why a preschooler requires self-confidence. The truth is, confidence starts at this age. The idea that they can achieve anything they want has to be reinforced. Now, you’re probably wondering how a trampoline can do this. When kids are trained to bounce on the trampoline and to attempt a variety of movements as they bounce, they learn to try new things. Since this is a fun learning process, they will persist until they finally achieve the movement required of them. When they achieve these movements, their confidence is reinforced. They will realize that these things are possible only if they persist. Let’s get back to the fun factor because that’s one of the good things about trampolines. They’re quite enjoyable, so you can always get your kids to try different things while bouncing on them. Subtle reinforcements in such insignificant ways are what accumulate and create the perception that anything is possible in a child’s mind. 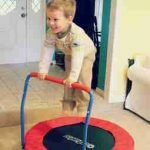 If you want to raise a kid who will persist in preschool and carry this trait throughout their entire life, we recommend trampoline training from a very early age. We would also advise you to check out different trampoline routines you could implement in your kids’ lives. 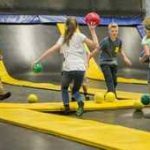 Among the health benefits of trampolining for kids is that they have to keep in mind that their fall has to be in the center. They also need to maintain a good balance along with that. All of this will contribute to developing a good posture in kids. Good posture goes a long way. As the kids grow, their posture will reflect their confidence and self-esteem. It is psychologically proven that the way you carry yourself can instantly have an effect on how powerful you feel. Did you know that NASA uses trampolines to replace all the bone tissue astronauts lose when they are in outer space? One of the trampoline benefits for kids is that it increases bone density and strengthens the muscle-bone relationship. We especially recommend an early morning trampoline routine because vitamin D could further strengthen children’s bones. Again, kids are at a great age to make the most of their bodies, so we advise you to start them young. As a result, you could save your children from conditions such as osteoporosis in the future. Out of all the trampoline benefits we have shared so far, this has to be the most important one. Preschoolers are exposed to different kinds of people in kindergarten. Some of the other kids may have picked up bad habits, and your child might eventually pick up some of them too. Sometimes, children even grow emotionally detached at this age. It is critical that parents are always with children of this age, paying attention to their every concern and aiding them in fulfilling their wishes. This way, they will know for sure that they can count on their parents no matter what happens. Now think of jumping on the trampoline. This is something that benefits adults and children as well. We have already told you how kids can benefit from it. As an adult, the trampoline can strengthen your cardiovascular system, immune system, and the hormonal system. It can also give you stronger mental capacity and be a great de-stressor after a long day. When we put all of these benefits together, we realize that bouncing on a trampoline is a “win-win” situation. As a parent, you get to enjoy quality time with your kid, and as a child, they will realize that home is a great place to have fun too. At this stage in a child’s development, they’re either already in school or looking for a good school to admit them. Whatever it is, once again, this stage too calls for some critical involvement in your child’s life. Now, if you put all that we’ve mentioned together, you will realize how much the trampoline can impact your child. When it’s time to start school, they will have a strong and fit body, a great relationship with you (their parent/guardian) and confidence that they can achieve anything they want as long as they pursue it hard enough. 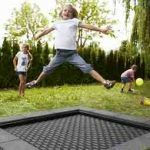 Nonetheless, there are unique trampoline benefits for kids who are going to school. Let’s look at a few below. One of the most important things we try to give children is a good education. We already know that exercising has mind-blowing effects on a person’s cognitive abilities. However, children who are going to school can’t engage in most forms of exercise. They are only left with jogs or walks at the most. With the trampoline, the situation changes. All you need to do is purchase one, and your child has access to a workout at any time of the day. Bouncing on the trampoline will increase the flow of blood to the brain. When the brain is well fed with nutrients, it works like magic. As a result, your child will be able to remain focused and alert throughout lessons. Isn’t this every parent’s dream? Furthermore, another benefit is that it boosts confidence and gives good posture. All of this will aid your child through school and help them improve their IQ level. But there’s more. Remember that we mentioned the trampoline could strengthen motor skills? At this age, your child will be exposed to different sports and art — swimming, basketball, baseball, ballet, music, and many others. What the trampoline can do is ease the performance of any of these activities for your child. Eventually, they will realize what they love doing the most and specialize in that skill. You are probably wondering why we mentioned this here. The truth is, at this age, children start spending more time outside. School and after-school activities will keep them occupied. They might start neglecting their hygiene and won’t always have access to sanitation. As a parent, even you might become quite lax in tailing them around. So what your child needs is something to keep their immune system strong. It’s no surprise that this is one of the health benefits of trampolining for kids. So as long as you make sure your child gets enough trampoline-time, you can ward off your concern that they might fall ill.
Nowadays, mental illnesses are becoming very common. As they step into a whole new world, adolescents get quite confused about their priorities. On top of this, their hormones start acting up, and sometimes, they don’t even know why they feel sad. Exercising is a great way to improve mental health. This is true for adults as well. Psychologists often encourage people to engage in some form of exercise when they suffer from a mental illness. If you feel the onset of an emotional breakdown, you know what to do now. The thing is, it won’t be easy to convince your 13 or 14-year-old to go out for a walk. Besides, they might be busy preparing for SATs and other examinations. They might also spend a lot of time honing their extracurricular skills. At this age, children want to excel in music, drawing, swimming and many other things. With a trampoline in the backyard, they can easily rebound every day without worrying about time. It’s also a great way to improve their mental health. You could save your child from the cusps of depression or anxiety just by encouraging them to rebound every day. The best part about trampolines is that they’re fun, convenient and inexpensive. Rebounding is a great form of exercise. In fact, a report from NASA revealed that it is more efficient than jogging as well, so there is no excuse for your adolescents to back away from rebounding. One of the trampoline benefits is that it can give the kids a good night’s sleep. We know that adolescents are fed the wrong idea — that sleeping early is “uncool.” As their parent, you can combat this impression by encouraging them to rebound. When they’ve had good quality sleep, their performance in school, overall outlook on life, and most importantly, their mental health will all improve. Endorphin is the body’s natural painkiller and pleasure-giver. If you have daughters who have reached puberty, they might experience menstrual cramps every month. Due to the hormonal changes, adolescents of both genders might experience severe headaches too. So they need enough endorphin in their bodies to help them cope with this pain. At the same time, having enough endorphin will also give them a better outlook on life. They will have a naturally pleasant and happy disposition. All of this will contribute to a better life altogether. Just twenty minutes on the trampoline every day can increase the production of endorphin. This might be a great way to give your children a better quality of life without lectures or scolding. We already know that these lectures are, in fact, futile. Feeling like they are not good-looking enough is one of the strongest reasons why adolescents suffer from mental illnesses. This is normal because as they grow older, they want to look a certain way and have a certain body type. There’s a good chance gaining weight is your adolescent’s biggest fear. However, losing weight is one of the best benefits of using a trampoline. Maintaining a habit of rebounding every day can actually give them a body type that they will be pleased with. This could save them from issues such as anorexia and binge eating. Now that we have clearly laid out all the trampoline benefits for kids, you can see how this contraption can transform your child’s life throughout their development. We assure you that as a parent/guardian, buying a trampoline would be a great way to give your child a good childhood and adolescence. So what are you waiting for? Help them start a rebounding routine right away! Don’t forget to share this post so that more people can benefit from it too, and if you have something to say, leave your comment below, as we would love to hear from you!